St. Martin's Paperbacks, 9781250111005, 304pp. It’s Christmastime in the quaint island town of Cloud Bay, where love is always in season... Will Fraser has believed in love at first sight since the day he first laid eyes on Mina Harper five years ago. There was only one problem: She was happily married. Then, when Mina’s husband was killed by a drunk driver, Will figured she’d want nothing to do with a guy who owns a whiskey distillery. So he’s kept his feelings locked away, knowing that not even a Christmas miracle would be enough to melt Mina’s heart. . . Mina believes her days of true love are behind her. Since losing her husband she’s kept to herself, content to do her own painting and stay out of the limelight that comes with her famous family. But when, after a freak accident, Will comes to her rescue, Mina can’t quite get him out of her mind. As curiosity turns into a fling during Cloud Bay’s first Christmas Festival, she finds it harder to convince herself that her feelings for Will are just mistletoe-inspired. Could Mina be ready to lay the past to rest and finally admit that what she really wants for Christmas—and forever—is Will? Emma Douglas would love to live in a world where professional napping was a thing. But until then, she thinks writing books is a pretty awesome alternative. When not writing about imaginary people, she can be found reading, doing something crafty, bingewatching TV, playing her latest song crush on repeat, or singing badly in her car. She lives in Melbourne, Australia in a tiny house stuffed full of books, too many craft supplies and two cats who take up more space than you would expect. 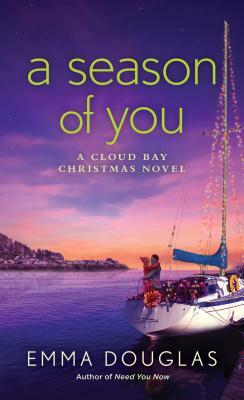 Emma is the author of the Cloud Bay series, which includes No Place Like You, Need You Now, and Season of You. Visit Emma's website to find out more!